Visited this Pub today at noon, we were the only customers. Had a Pint of Brakspears Best Bitter. Unfortunately the Barrel went and we waited for a new one to be connected, this was very good and at £3.30p a pint reasonable. The other hand Pump beer available was Morrells Varsity. Pub advertises DJ and music nights and offers free WiFi. However I found the Decor to be Tatty and souless, there were bare floorboards and formal tables, more of a restaurant than a Pub as it advertises itself as a Thai Restaurant. Staff were friendly, but sorry will not be returning as there are better pubs in Wokingham. Nice relaxed pub that always has a couple of real ales on and some very nice wines. Also, the Thai food is some of the best I've had (certainly the best in Wokingham) and they do takeaways too. Can't actually fault the place. If ever a pub was ruined by being sacrificed to 'modernity' then this is it. Used to be a smashing old pub now its like a Harley Street waiting room. Thai food is good fun tho! Excellent child-friendly pub, that even goes so far as to host NCT coffee mornings. 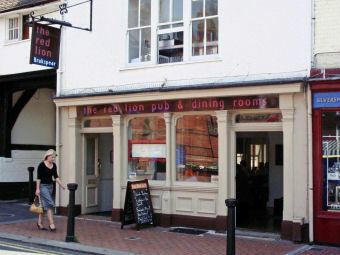 Good food in both the bar and the restaurant, freshly cooked from an extensive menu. Staff can be a little slow sometimes but make up for it in friendliness. This is the one pub in Wokingham that parents can keep going back to.